Rajnikanth codes directly in the hex or executable file. Rajnikanth does not get compiler errors, whatever he codes becomes the syntax. Once Rajnikanth was denied onsite, all the onsite colleagues came offshore to work with him ! All nodes back off when Rajnikanth wants to transmit a frame - even the bus monitoring signal - CSMA CD stuff. Rajnikanth can put a breakpoint in the hex file & debug . When Rajnikanth tries to send frame on CAN all nodes back off, permanently. Rajnikanth once attended the skip level meeting, The CEO of company raised some genuine concerns to Rajnikanth. Rajnikanth's just one soldier can beat everyone in chess, with just one move. Once Rajnikanth ran Misra check for his files & gave Rajnikanth's warnings to Misra. The Ansi C compiler has changed the null character \0 to Rajnikanth. He is the end of all things. Intel has now agreed to change their punch line, " Rajnikanth inside, Logic outside"
Rajnikanth once keyed in high level language on 8085 & it ran. Rajnikanth's car does not need MIL, he knows what error has occurred. Rajnikanth by mistake typed the attributes twice value - this became xml. Rajnikanth played scrabble & ran out of alphabets in first chance itself. Once the MIL (malfunction indicator lamp) glowed y mistake, Rajnikanth was son angry that it never turns on now again, the headlights are always turned on in fear, indicators are just too confused. The true name of Rajnikanth was Rajnican't, but there was nothing Rajni can't do. Hence it was renamed to Rajnikanth. else.He will Delete the INTERNET altogether daa MIND ITT!!!.." 1. Once upon a time Rajnikanth used a tooth powder to get strong teeth. is today known as the oxford dictionary!! *Hrithik tried to participate in a dance competition with Rajnikanth. Result: He is in a wheel chair in Gujarish. in Jr.college................ He chose science, arts and commerce!!!!!!! 7*Rajnikanth can make calls from his iPod to his iPad...!!! Thats how the Log table was invented. Rajni: Rascala, how do you think the earth spins!? 14. Once a big stone obstructed Rajani's way. to guess wat happened . Rajinikant won d race on neutral gear! 18. Rajinikanth doesnt breathe. Air hides in his lungs for protection. which were spreading through sms and internet. really think they are jokes? now called.............. "OSAMA BIN LADEN"
today that diary called as. 29. Once Rajnikant taught a boy how to kiss. Now that boy is known as '. Yes RAT paper.... : : Rajnikant Aptitude Test !!! Rajanikanth Funny Joke "Mind It"
When Rajnikant was a Student¦!!! Rajinikant got 150 questions in exam paper asking - "Solve any 100 questions"
One day Rajani thought to play cricket in monsoon and rain stopped due to play. "Who says the world will be destroyed in Dec 2012..Rajnikant just bought a Laptop with three years warranty"
Rajni can walk faster than light. "Rajni cannot be created or destroyed; it can only be changed from one form to another". Once a photo of Rajnikant was given for Xerox. Don't even try to guess what happened. Rajnikanth was shot today... Tomorrow is the bullet`s funeral! Rajnikanth killed a terrorist in Pakistan 'via Bluetooth'! Rajnikanth`s pulse is measured in Richter scale! When God watched Robot, he said, "Oh my Rajnikanth!" Rajnikanth is the secret of Boost`s energy, and Complan is a Rajnikanth boy! Einstein died watching that since Light came second!! 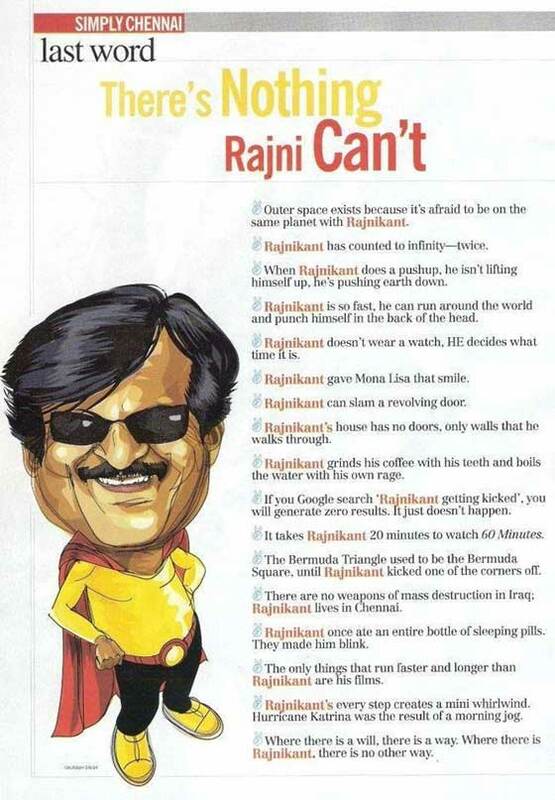 Intel's new ad: "Rajnikanth Inside"
An email was sent from Pune to Mumbai, Rajinikanth stopped it in Lonawala! Rajinikanth went to the world cooking championship...of course Rajini won. But guess what did he make in final??? Lal mirchi ki meethi kheer. Rajnikanth can observe all the messier objects, ......without the telescope  ! Rajnikanth does not adjust the focus for clear visibility, the object under observation moves back -forth in space so that Rajnikanth can observe it clearly. Rajnikanth;s camera is not having exposure option, as all the photons come faster & for the image quickly when he is taking a pic. when Rajnikanth starts to observe, all clouds move to the other hemisphere ! It was Rajnikanth who observed all the galaxies are moving away from each other, naked eye ! Once Akarsh & Rajnikanth went for DSO, Akarsh packed his big telescope, & lots of star charts. Rajnikanth just brought his sunglasses ! Rajnikanth sees color in eyepiece ! Rajnikanth has memorized all the star charts & does not need any now ! First Amar was also having big telescope like Akarsh, but since he did the mistake of inviting Rajnikanth for Messier marathon, Rajni got angry & the effect :  Amar roams around with binoculars ! Since marathon was insult for Rajnikanth, since he could cover all of them in no time !